We've moved! Our new location is in the building with the blue roof at 34382 Carpenter Way - located just off Route 1 across from the Lewes-area Wawa. It is accessible both via Route 1 and via King's Highway. Free tours are available Monday through Friday, 9 a.m. to 2 p.m. Please enter the building through the front and go to the 2nd floor business offices first. An elevator is available in the lobby. There is a doorbell on the second floor business office. Call for more information: (302) 703-3576. The new location allows our team to provide more engagement for clients, including a Men's group, art classes, music room, and planned horticultural therapy! The Adult Activities Center at Gull House is currently accepting donations of house plants for the horticulture program. What is the Adult Activities Center? The Adult Activities Center at Gull House is a structured and supervised adult day care program designed for functionally impaired persons who are 60 years of age or older. The primary goals are to avoid or forestall long term care treatment; to support or improve social, mental, emotional, and physical levels of functioning; to enhance the quality of life; and to provide respite to families and caregivers. Gull House opened in the spring of 1987 in response to the community's need for an intermediate care facility to bridge the gap between 24-hour home care and nursing home care. Its services are a vital part of the continuum of care for the elderly, providing a healthful atmosphere and reassurance and support to their families. In 1994, Eileen Hamilton and I retired from a defense contractor north of Baltimore, Md. Eileen had worked there as an executive secretary for 16 years, and I as an engineering executive for 38 years. We married a year later and moved into my home in Rehoboth. Eileen had three grown children from her previous marriage: Charles, Tim and Caroline. They visited us often with their children. 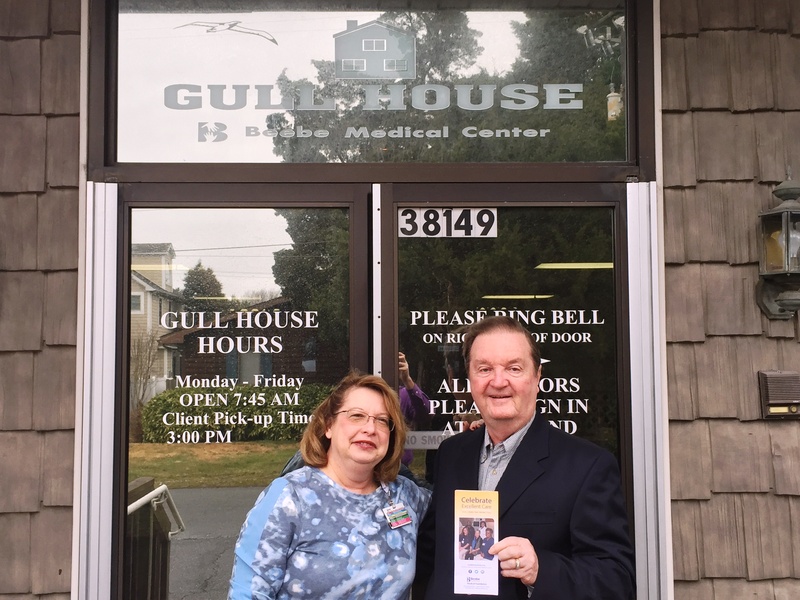 Read about how Gull House impacted the lives of Eileen and her family. What services do we provide? The Center is open Monday through Friday from 7:45 a.m. to 3:30 p.m. Our facility and business office is open from 7:30 a.m. to 4 p.m. Our recreational program begins at 9:00 a.m. and ends at 2:30 p.m. All clients are discharged to home from 2:00 p.m. to 3:15 p.m.
A hot lunch and snacks are provided daily. Special diets can be arranged. All meals meet the U.S. Recommended Daily Allowance. Planned activities are scheduled daily. Activities include: walks, outings, exercise, arts and crafts, games, cooking, reminiscence therapy, reading and storytelling, discussion groups, music and singing, and special celebration events. Programs are customized to meet each client's particular needs. A full-time RN/LPN is available to give medications, monitor vital signs, and perform basic nursing procedures. All staff members are certified Dementia Practioners — certified by the National Council of Certified Dementia Practitioners. 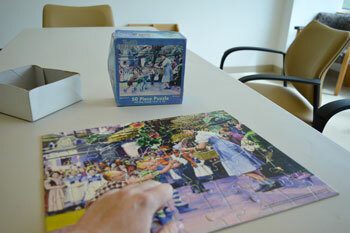 A Caregivers Support Group meets once a month for discussion, encouragement, and sharing of ideas and resources. Transportation to and from Gull House is available at a nominal charge. For more information, contact us at (302) 703-3576.